The beauty of this lovely bowl of pasta is that you can have it ready in 20 minutes, from start to finish. For this dish to work, you really need to have fresh tomatoes at the peak of their ripeness. They don’t have to be Jersey tomatoes. You can use plum tomatoes, beefsteak tomatoes, or even heirloom tomatoes. Fresh, sweet, ripe tomatoes bursting with juice are absolutely key. Sprinkle a pinch of salt and grind some black pepper over the scallops. Set aside for 2-3 minutes. Meanwhile, in a large skillet, heat olive oil until almost smoking. 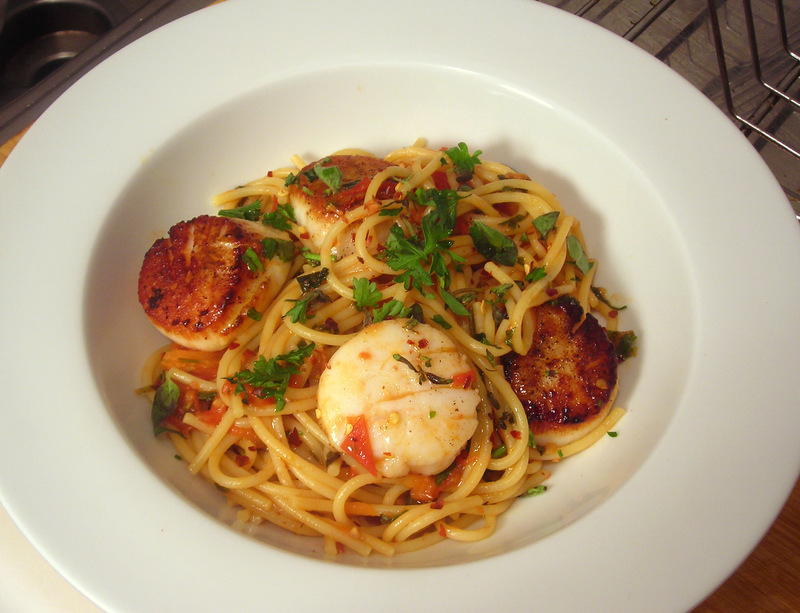 Add scallops to the pan and cook without moving them until crisp and golden brown, about 5 to 6 minutes; do not turn. Remove to a plate and set aside. In the same skillet, add the remaining tablespoon of olive oil, then add the tomatoes. Let tomatoes break down and cook until the liquid in the skillet has reduced, about 5 minutes. Deglaze the skillet with white wine. Sprinkle a pinch of salt and pepper, add chopped herbs. Stir occasionally. When the liquid has reduced its volume by half, lower the heat to medium, add the pasta to the pan. Toss. Return scallops to skillet. Toss a few more times, then serve at once. This will be my submission to Midnight Maniac Meatless Mondays 38 and Just Another Meatless Monday #65. It will also be my first submission to Presto Pasta Nights #219, a weekly foodblog event currently hosted by Simona of Briciole and organized by Ruth of Once Upon A Feast. 21 Jun	This entry was published on June 21, 2011 at 12:31 am. It’s filed under cooking, food, food photography, general, Italian food, Presto Pasta Nights, recipe, summer and tagged dinner, food photography, foodblogging, Just Another Meatless Monday, locavore, meatless, Midnight Maniac Meatless Monday, pasta, scallops, spaghetti, tomatoes. Bookmark the permalink. Follow any comments here with the RSS feed for this post. A truly beautiful dish! Tomato season has not started yet here, so I need to wait before I can try. In the meantime, I can look at the photo 😉 Thank you for your contribution to Presto Pasta Night.